Below are pictures of Makayla’s host family. 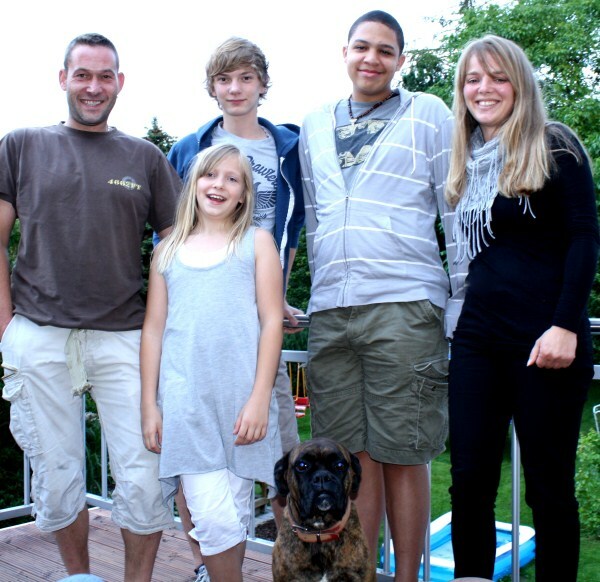 Below is a picture of Hailey and her host family. 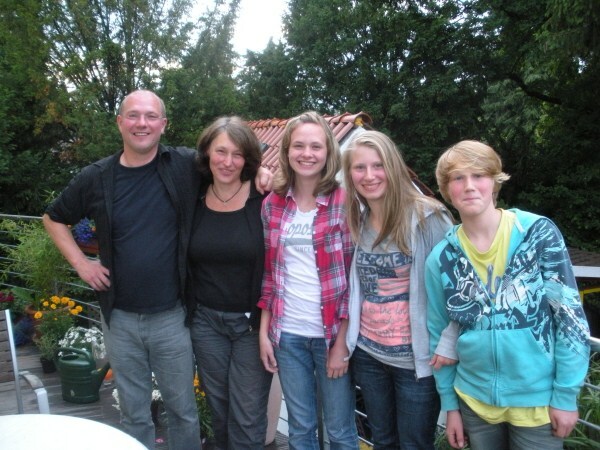 Below is a picture of Emma and her host family. 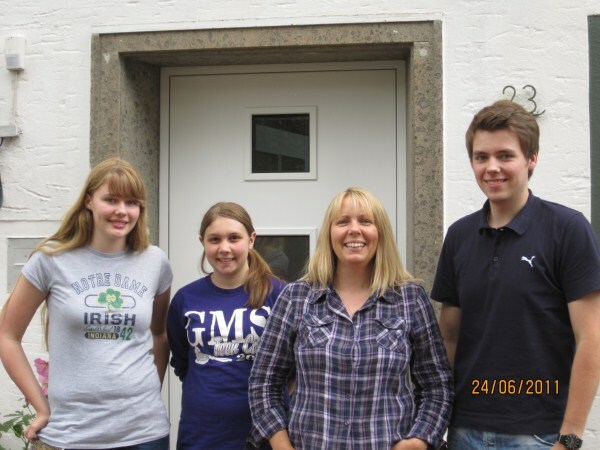 Below is a picture of Lauren’s host family and home in Bielefeld. Weather alert: Today was a beautiful, sunny, warm day! The next three days are supposed to be in the mid 80s with only sun!! The worries about the e-coli problems seem to have lessened in the news, but below is a picture seen in the windows of many Asian restaurants. Your health is important to us. ALL DISHES MADE WITHOUT SPROUTS. But everything tastes like it usually does. 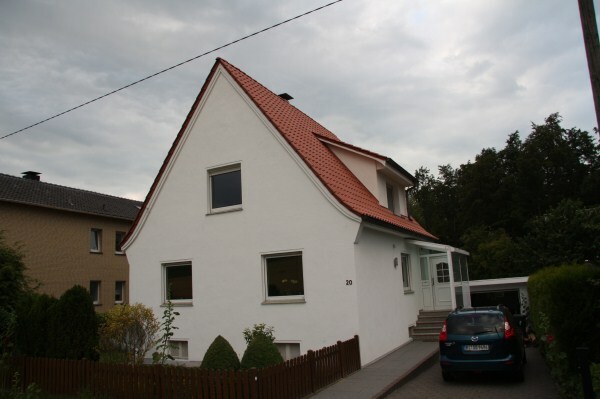 Below are pictures of Alex’s home in Bielefeld and his host family. Below are pictures of Noah’s host family. 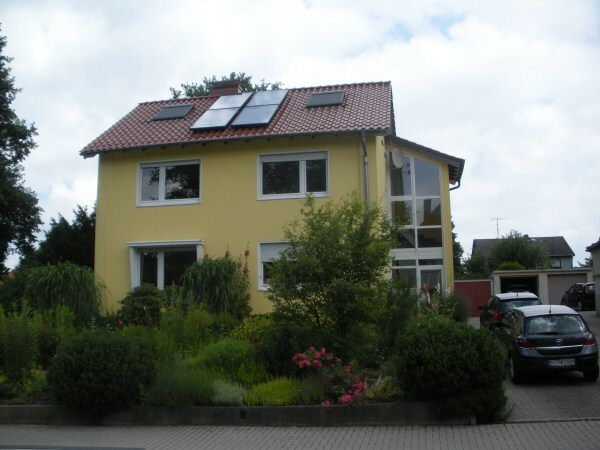 Below are pictures of Kylie’s host family and her home in Bielefeld. 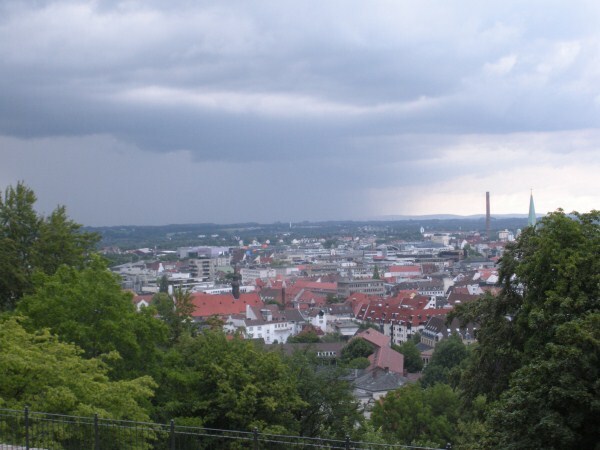 The weather continues to be less than stellar here in Bielefeld. On Sunday it rained the entire day and the temperature hovered around 52 degrees. 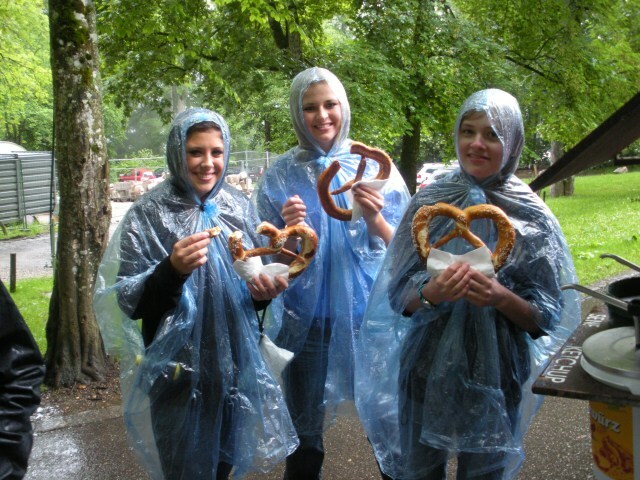 Despite the weather students are still enjoying themselves, although pangs of homesickness are starting to surface. Who would have ever thought that someone could miss boring old Goshen!! 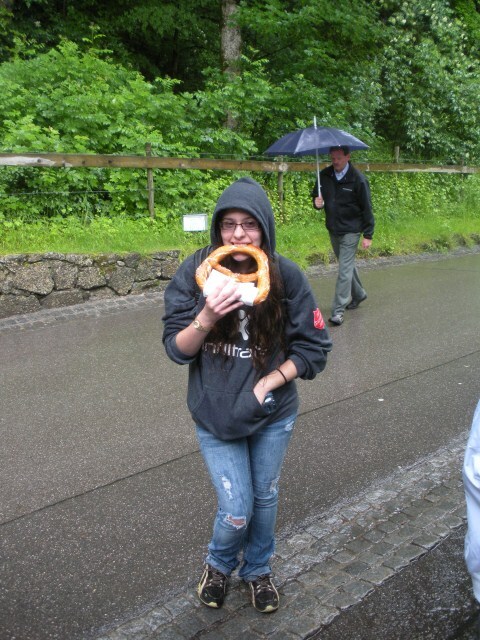 Emma went to Hamburg with her host family on Saturday and Alex and Lauren and the Graves family went with Alex’s host family to see the Hermannsdenkmal and the Externsteine outside of Bielefeld. 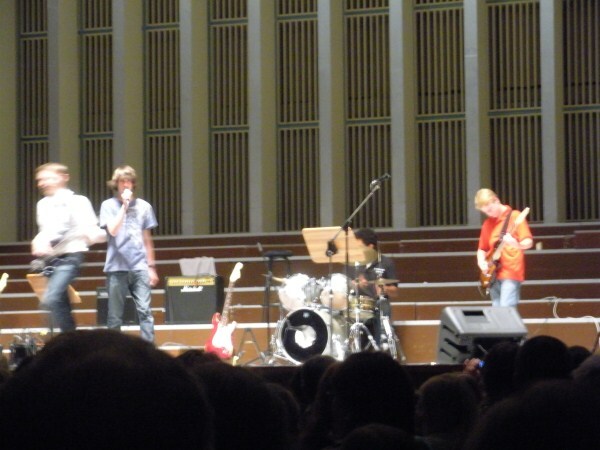 This evening was the end of the school year concert at our partner school, the Max-Planck-Gymnasium. It showcased groups from grade 5 to grade 13 and included an orchestra, several choirs, a jazz band and a pop band. 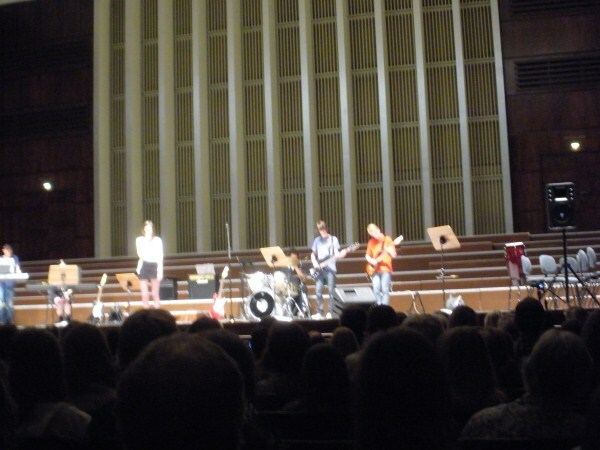 It was also fun to see Bielefeld students at the concert who have visited GHS during the past two years. Mondays, Wednesdays, and Thursdays 8:30-11:00 a.m. The first day of school for students is Wednesday, Aug. 17. 613 East Purl St. or call 533-8631. 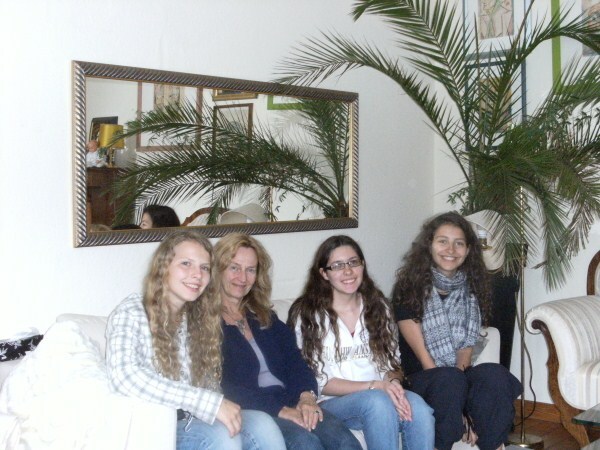 Students have settled into their host families and are getting along very well. Students attend language classes every day from 9:00-1:00 at Tandem International, the language institute we work with. 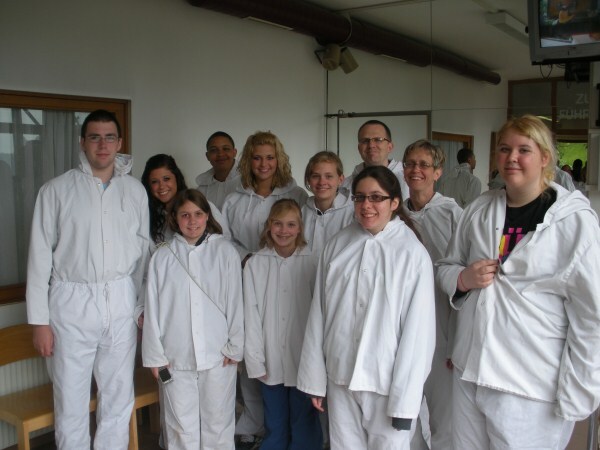 The pictures below are of students in class with their teacher Jessica. Monday was a day of travel. We spent the morning walking around Salzburg. The weather was still nice and the sun was also shining. On our way to the train station at about 1:00 it clouded up again and began to rain, which was no big surprise to any of the students. Because it was a holiday weekend in Germany and Austria, the trains were rather full. We traveled to Muenchen and then changed trains and boarded the ICE (German high speed train). It was a 6 hour journey to Bielefeld. The train reached speeds of around 300 kph (about 180 mph). 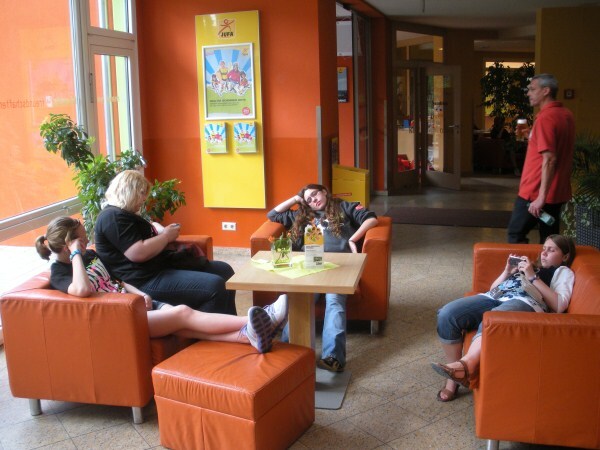 The closer we got to Bielefeld the more nervous people started to get. 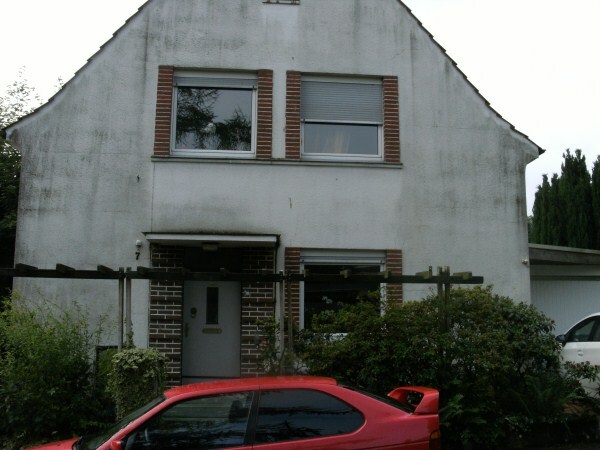 Students were met at the train station by their host families and moved into their new homes for the next three weeks. Students spent the morning today, June 14, in language instruction at Tandem, the language institute. Their homework for this evening is to interview their host family to see what their stereotypes about Americans are. Students met their host siblings after class and everyone split up into groups and participated in a Stadt-Ralleye (city scavenger hunt) to get to know the city of Bielefeld better. Sorry for the lack of pictures. 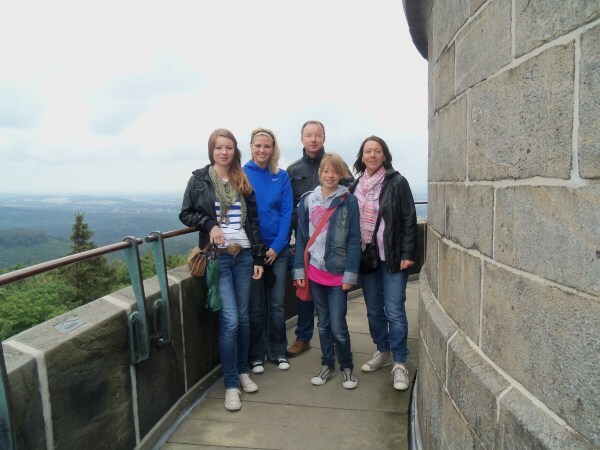 We’ll post some tomorrow of Bielefeld and language classes. Today we experienced the first sun since our arrival in Germany and Austria. After breakfast students divided into groups and went on a scavenger hunt to explore landmarks in the old part of the city in Salzburg. 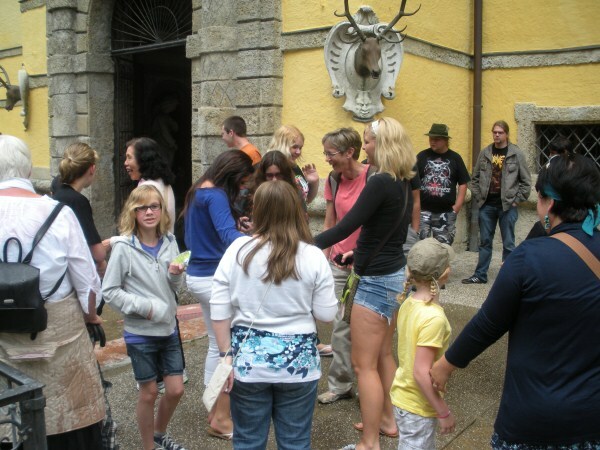 In the afternoon we took the bus to the south edge of the city to visit Schloss Hellbrunn. 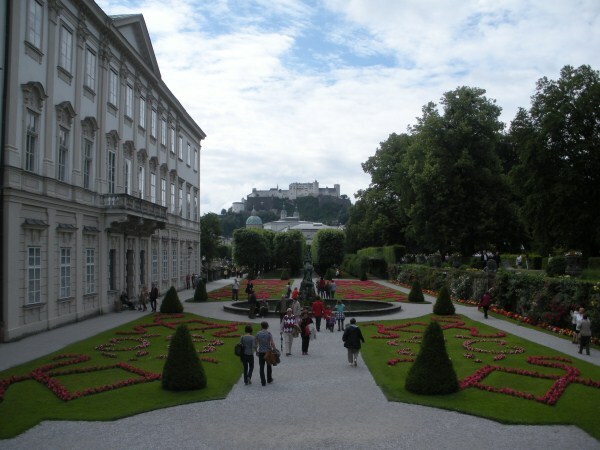 Salzburg was once ruled by the Archbishops of Salzburg. 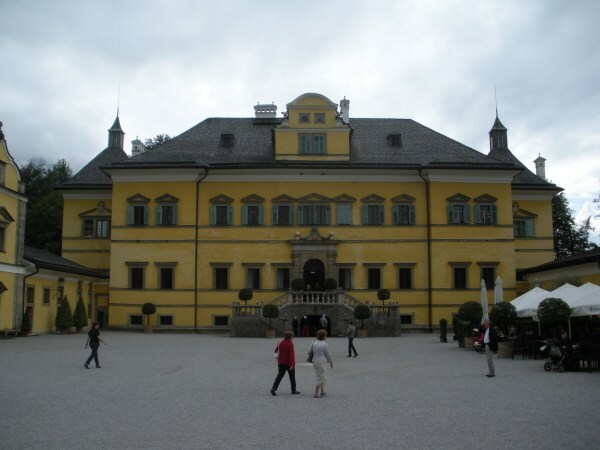 Hellbrunn is a summer palace built in 1615 for the Archbishop to entertain guests and escape the heat of the city. 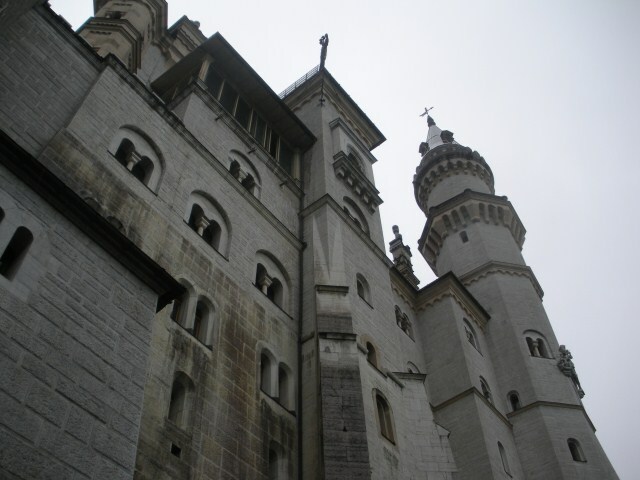 The archbishop was quite a trickster and built a palace with displays, fountains and gadgets all running on water power. The outside dinner table had jets of water which would spray up through the seats on the guest. Noah and Kirsten volunteered to try it out and came away with wet behinds. By the end of the tour everyone in our group was wet to some degree. After the tour of the water parts outside of the palace we toured the inside of the palace. 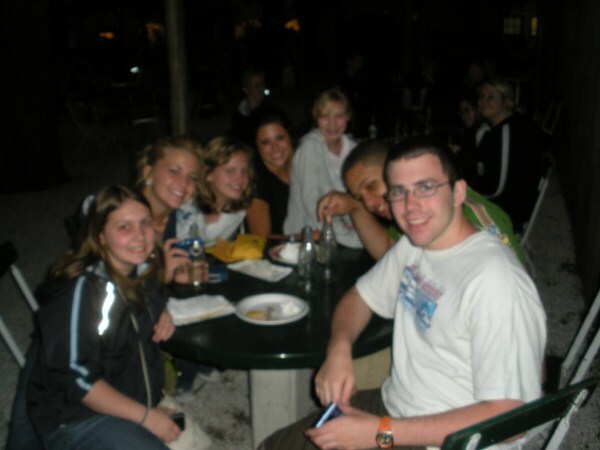 Upon returning to the hotel people went into the city and ate and came back to relax. We are all feeling the ache in our legs, feet and back from all of the walking we’ve been doing. Tomorrow afternoon we leave for Bielefeld. Students are excited to meet their host families. 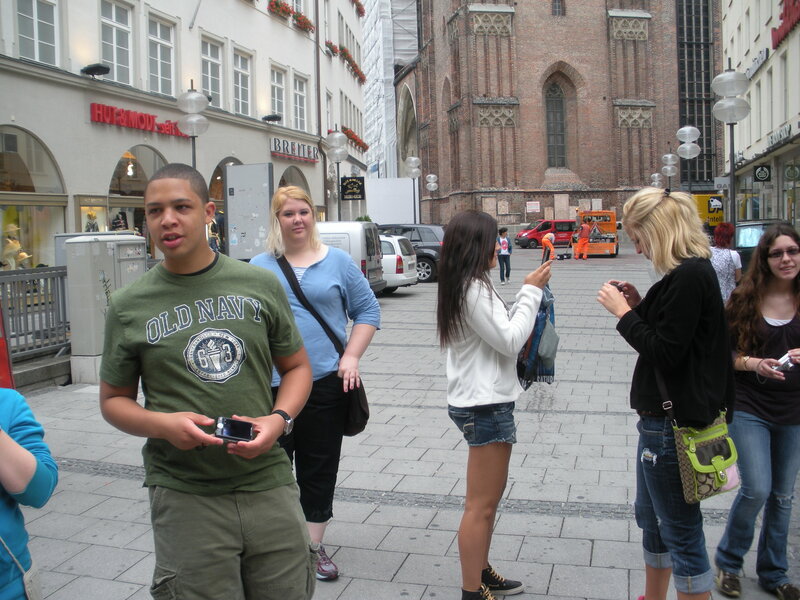 We spent the morning of June 10th shopping in Muenchen before our afternoon departure for Salzburg. Upon arriving in Salzburg we took a bus to our hotel and checked in to our rooms (3 guys in one room and the 8 women in the other). We then walked through the city and ate dinner in the garden of the Augustiner Braeu, a former monastery. This morning we awoke again to cloudy skies and cool temps. After breakfast on the terrace at the youth hostel we rode back to the train station and took a train and then a bus south into the mountains to the town of Hallein. 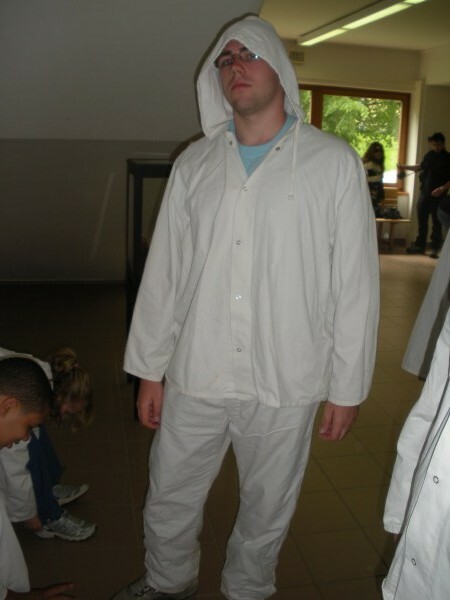 The visit to the salt mine was awesome. Salt has been mined here since 500 B.C. beginning with the Celts. 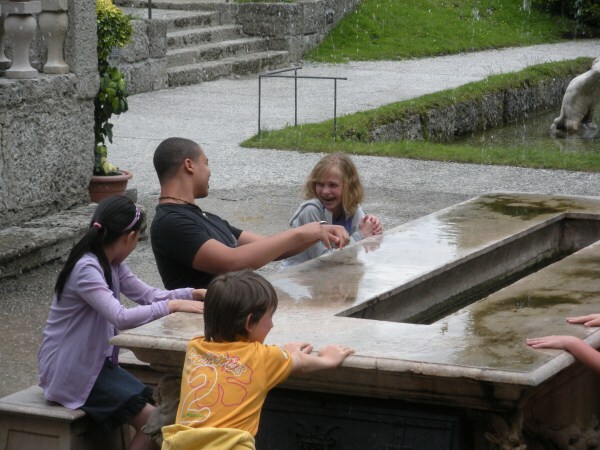 Salt is also what made Salzburg a rich city and gave it its name. We put on mining clothes and then rode a small train into the mountain. 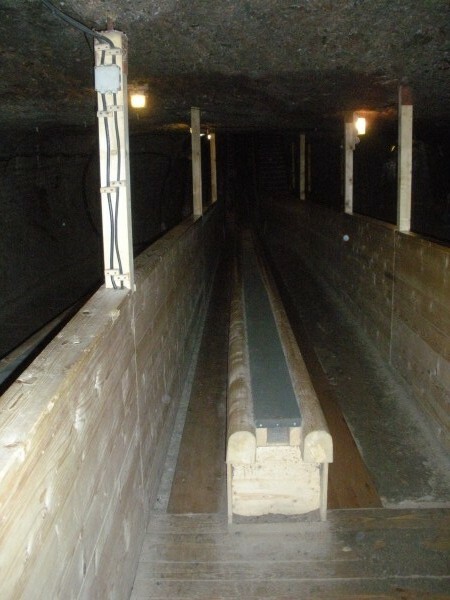 At two different times we had to slide down long wooden slides to get to the next level of the mine. We also rode a boat across a small salt lake deep in the mine. Upon our return to the city we had dinner on our own. The weather report says sun tomorrow. We’re holding our thumbs (German for crossing our fingers!). Today was a very cool and rainy day. 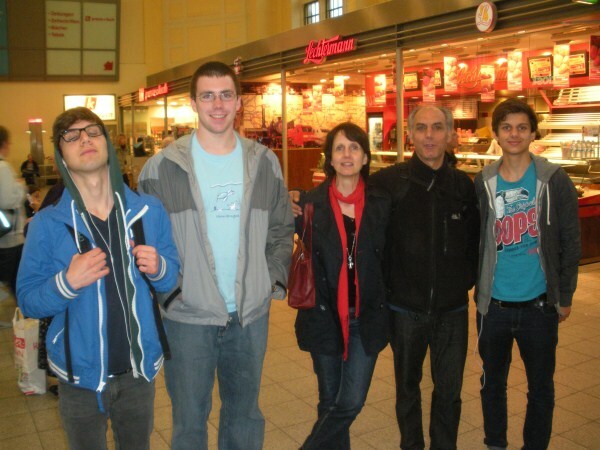 After an early breakfast we left for the Hauptbahnhof (central train station) and boarded a train for Fuessen. After a 2 hour ride through the countryside we boarded a bus for the little village of Hohenschwangau. 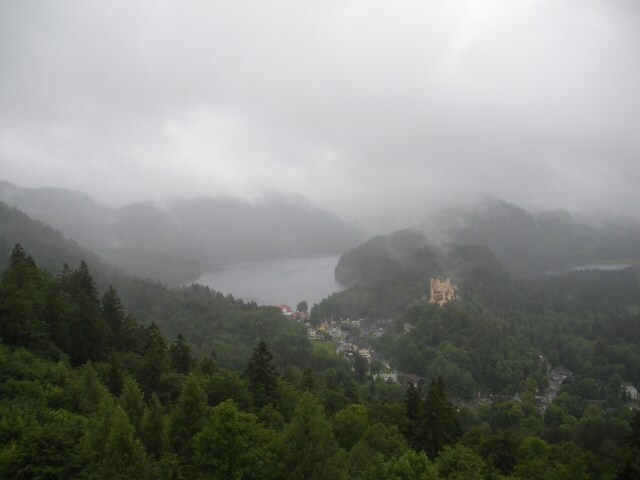 Hohenschwangau is in the foothills of the German Alps. 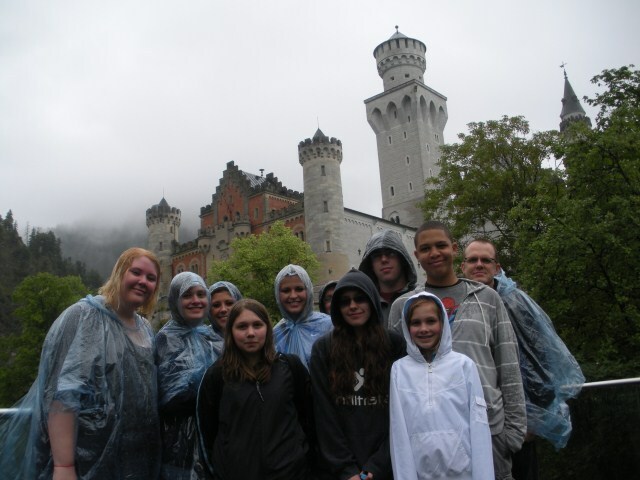 We purchased tickets for a visit to Schloss Neuschwanstein (Castle Neuschwanstein) and made a 30 minute, up the mountain, through the forest hike to the castle. 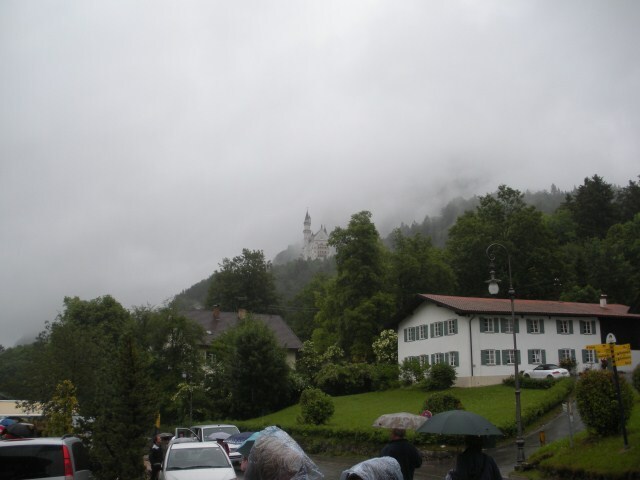 We had planned to hike further up the mountain above the castle, but the weather was so poor it was even impossible to see the mountains. We returned down the mountain, which turned into a 20 minute hike, and then had time to wander through the village in search of trinkets. We returned to Muenchen and had the evening free to eat and explore. We’re hoping for better weather tomorrow. Teacher’s note: This is one impressive group! Despite a lot of walking, grueling airport layovers and cold and wet weather, I have heard no whining. 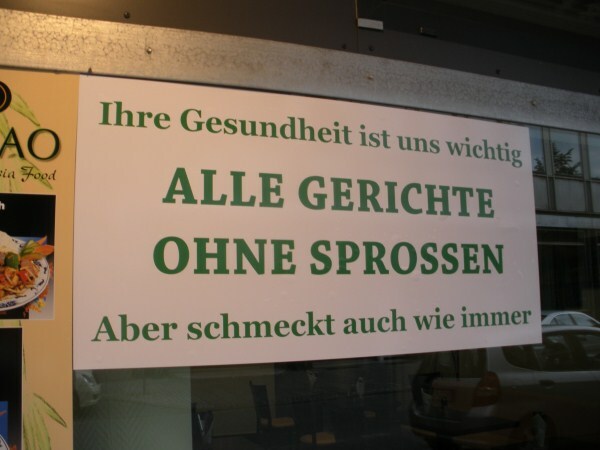 Okay, the only whining I have heard was when I encouraged people to try the sauerkraut! The first morning at the hotel after our group had left the breakfast room the woman working in the kitchen asked me where our group was from. I said from the US. She was astounded. She said that most of the student groups they have from the US are loud and obnoxious, but she said our group was quiet and very polite. I thought maybe it was just sleep deprivation, but this morning was the same! Tyler Wynn, 2011 graduate of GHS, has been invited to compete in the prestigious Midwest Meet of Champions on Saturday, June 11 at Fort Wayne Northrup High School. Tyler is a 2 time state medalist in the 1600 m run and will run that race in this meet. He is the son of Mike and Lee Wynn. The meet pits senior track & field athletes from Ohio, Indiana, and Michigan against one another. Ceremonies begin with the Parade of Athletes at noon and the events start at 12:30 PM. The 1600 m run is estimated to start at 2:40 PM. 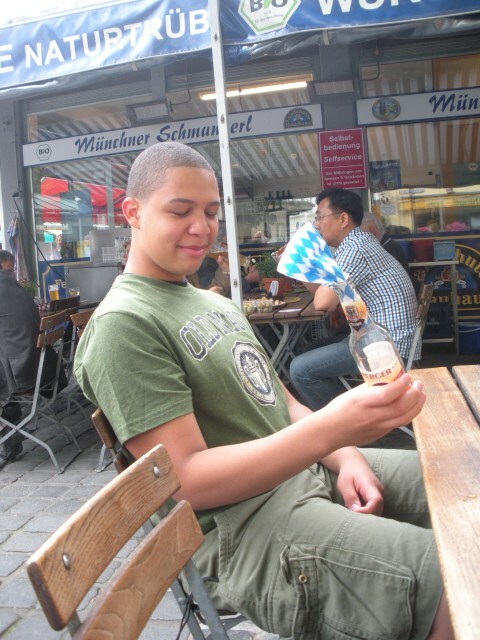 Alles Gute zum 18. Geburtstag, Dara! June 8: We woke up today feeling much better! We had breakfast in the hotel and then toured the central part of Muenchen. 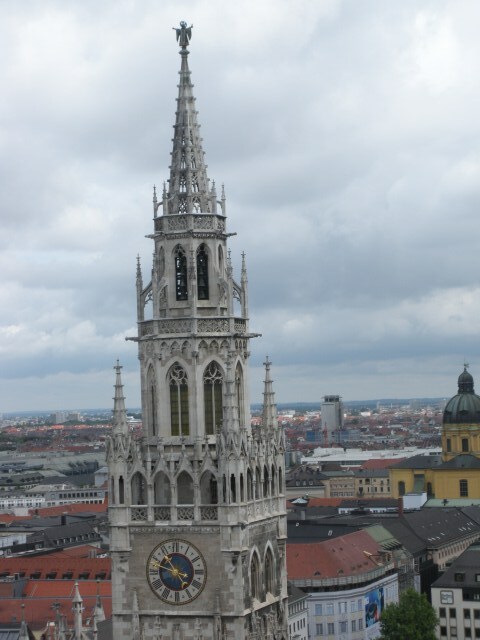 We visited the new city hall and the Glockenspiel, the Frauenkirche (the cathedral), the Asamskirche (an extremely ornate church), climbed the tower of the St. Peterskirche for a birds-eye view of the city, and ate lunch the the Viktualienmarkt, an open air market in the center of the city. 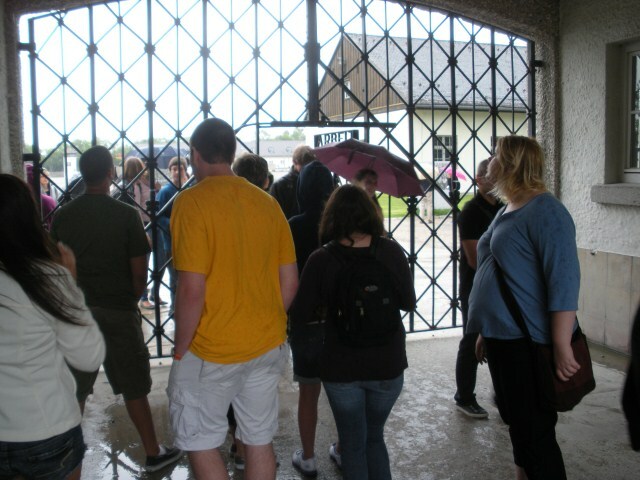 In the afternoon we took the train to the Dachau concentration camp memorial. We spent several hours there walking around the grounds, visiting a museum detailing the rise of Nazism in Germany and the development of the camp, and watched a film about the camp. The afternoon was made even more depressing by a constant, cold drizzle while at the camp. 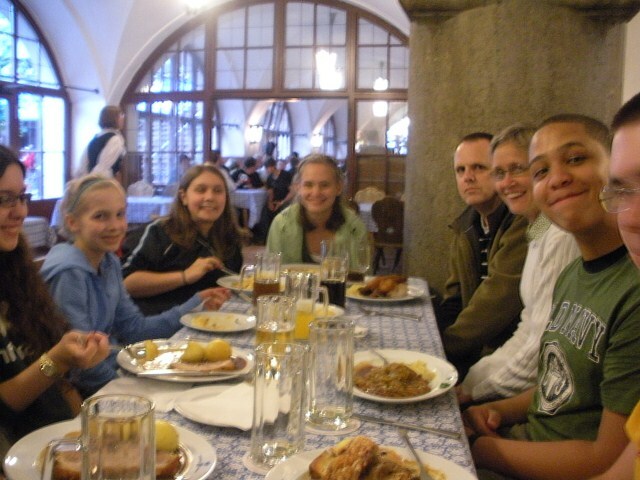 In the evening we returned to the center of the city and ate supper at the Hofbraeuhaus, the largest beer hall in the world. The students ordered typical Bavarian fare ranging from roasted chicken, potato salad, and sauerkraut to the more interesting roasted pig knuckle. 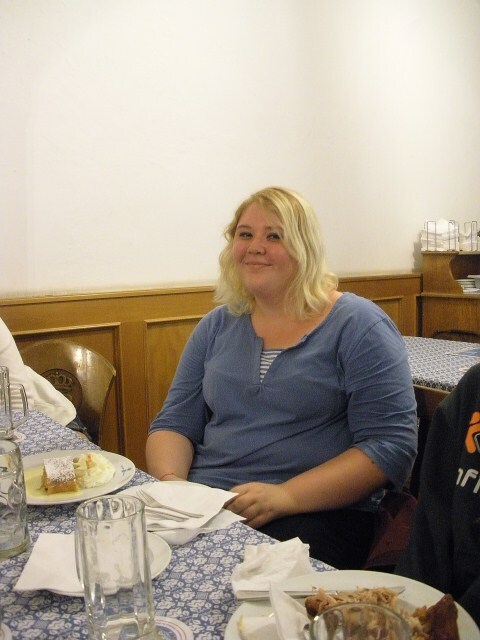 We ended the meal with a piece of Apple Strudel to celebrate Dara’s 18th birthday. Our trip began this morning at 10 am with our departure from GHS. Mr. Kirkton drove us to the airport. We checked in and then hung out until the flight boarded. The flight to Helsinki was 8 hours and 50 minutes. The sun dipped very low in the horizon, but never went down, even though it was night. During part of the trip we could see mountains and glaciers as we flew over Greenland. 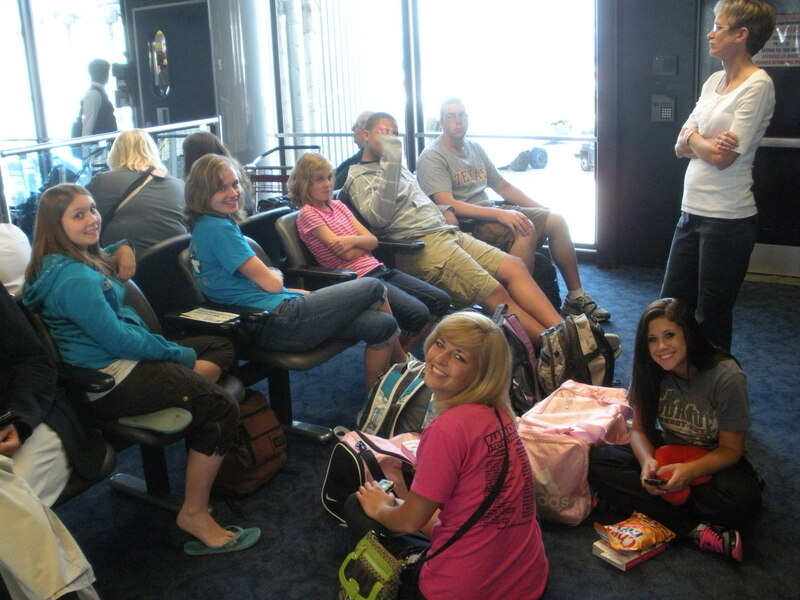 We landed in Helsinki at 8:30 am (1:30 am Goshen time) and settled down for an 8 hour layover. We slept on hard seats in the terminal and generally felt miserable. We were all glad to board our flight to Muenchen. We landed in Muenchen 2 hours later, picked up our luggage and took a 40 minute train ride to the center of the city and checked in to our hotel. We then walked a bit in the old part of the city, found some Turkish food for supper, and then headed back to the hotel for showers and some much needed sleep. The bus to the airport will depart from the circle drive in front of GHS on Monday, June 6, 2011 at 10:00 AM. Please remember to bring all of your travel documents with you. You will also need to hand in your completed test to Mr. Collins. Our flight leaves at 3:40 PM CST. You might also want to bring along something for lunch and a drink. 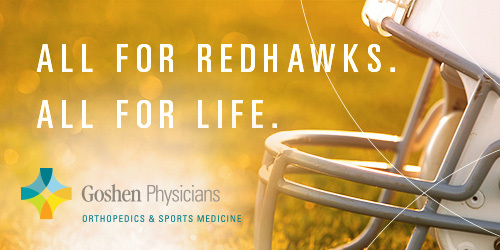 The Goshen High School Spring athletic recognition night is Monday, June 6. The evening will begin in the GHS Auditorium at 7:00 pm, with individual team recognition ceremonies following the group session. There will be cookies and juice available in the Commons after the individual team sessions.